Educator, race and gender activist, writer, suffragist, and political organizer, Addie Waites Hunton was born in Norfolk, Virginia on June 11, 1866, to Jesse and Adeline Waites. After her mother died when she was very young, she moved to Boston, Massachusetts to live with her maternal aunt. Hunton earned her high school diploma at Boston Latin School and in 1889 became the first black woman to graduate from Spencerian College of Commerce in Philadelphia. In 1893, she married William Alphaeus Hunton, who had spearheaded the establishment of services for blacks in the Young Men’s Christian Association (YMCA) in the city. Soon after their marriage the couple moved to Atlanta, Georgia, where Addie worked as a secretary at Clark College and helped her husband with his YMCA work. In the wake of the Atlanta Race Riots (1906), the Huntons moved to Brooklyn, New York. They had four children but only two survived infancy. In 1907, the Young Women’s Christian Association (YWCA) took note of Hunton’s work for the organization and appointed her secretary to work among black people. She began a tour of the South and Midwest, drawing a number of influential black women to the YWCA. From 1909 to 1910, Hunton took her children to study at the Kaiser Wilhelm University in Strasbourg, France, after which she enrolled in courses at the College of the City of New York. In 1914, her husband William died. From 1906 to 1910, Hunton served as a national organizer for the National Association of Colored Women (NACW). She also became a leading suffragist, supporting black women voters at the National Woman’s Party convention in 1921. Following the ratification of the 19th amendment that allowed women the right to vote, black women were denied the vote particularly in the South. Hunton pressured white suffrage leaders to support the black women’s vote. Her effort brought the issue to public attention. During World War I, Hunton and two other African American women became the only women workers assigned by the U.S. Army to work with 200,000 segregated black troops stationed in France. 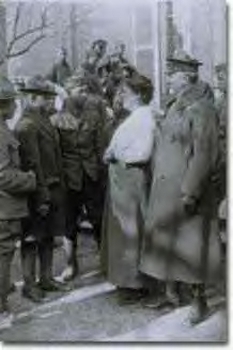 When Hunton returned to America in 1919, she and her coworker, Kathryn Johnson, wrote about their experiences with the troops in the book Two Colored Women with the American Expeditionary Forces (1920). By the third decade of the 20th Century Hunton had become a peace activist. Her determinate to contribute to that cause led her to resign from the YWCA and become a part of the international peace and Pan-African movements. Hunton worked as vice president and field secretary of the National Association for the Advancement of Colored People (NAACP) and she helped to organize the fourth Pan-African Congress in 1927. In 1926, she wrote a report on Haiti, condemning U.S. occupation of the country. Addie Hunton later published a book about her husband’s life and work entitled William Alphaeus Hunton A Pioneer Prophet of Young Men (1938). She died in Brooklyn on June 21, 1943, having dedicated her life to issues of racial and gender equality. Christine Lutz, “Addie W. Hunton: Crusader for Pan-Africanism and Peace,” in Portraits of African American Life Since 1865, ed. Nina Mjagkij (Wilmington, DE: Scholarly Resources, Inc., 2003), 109-127; Darryl Lyman, Great African American Women (New York: Random House, 1999).